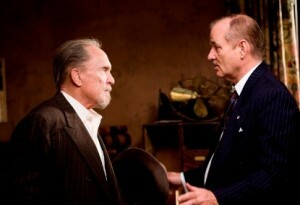 Robert Duvall (l.) and Bill Murray star in Get Low. Strong performances and a memorably strange premise highlight the movie Get Low, an earnest and respectable first film from cinematographer-turned-director Aaron Schneider. Robert Duvall (Crazy Heart) is Felix Bush, a hermetic old guy in 1930s Tennessee who emerges from his backwoods solitude one day to come into town and arrange for a “funeral party” with local undertaker Frank Quinn (Bill Murray, Caddyshack) and his protégé (Lucas Black, Legion). The deceased? Well that would be the aging Felix himself, who has every intentional of attending the gathering. Further, he wants Frank to make sure that all the locals and those from surrounding counties attend and have a story to tell about Felix. In exchange, Bush will bequeath his land to the lucky winner of a lottery, to be chosen at the funeral. Not surprisingly, Felix has an agenda of his own and mysteries from his past that he’d like to straighten out at the deathly blow-out. Inspired by on the real-life story of a Tennessee man who pretty much did what Duvall’s Felix does in the movie (“inspired” rather than “based” as the things going through Felix’s head are the moviemakers’ inventions), Get Low is an entertaining, pleasant view, its cast of seasoned performers all turning fine performances, particularly journeyman Duvall who, at the age of 80, isn’t showing any signs of slowing down. Felix has a lot of history and, again, a lot going on inside his head, and Duvall’s control of this volume and histrionics switch is smart and measured. Ditto for Bill Murray, who never gets carried away with his occasionally too-clever timing. The script by the team of Chris Provenzano and C. Gaby Mitchell, from a story by Provenzano and Scott Seeke is fine until the final third, when the funeral party is upon us. At that point, a few too many explanations, mysteries solved and resolutions are thrown in, changing up the pace and formality of what transpired in the first hour. But it’s nothing fatal. There’s a generous lot of bonus features on hand, kicking off with a lively commentary featuring director Schneider, stars Duvall and Sissy Spacek (Carrie). and producer Dean Zanuck. The featurettes are rather standard stuff, focusing on the film’s Deep South seeing, the screenplay and a short piece about getting into character, a feat that doesn’t appear to be much of a problem for Mr. Duvall and Ms. Spacek A 10-minute A&A with the cast and filmmakers recorded at the film’s screening at the Tribeca Filim Festival last year is, like the commentary, spirited and enjoyable.